Afroskull’s 15th Anniversary Celebration Part 2 – NYC + costume contest! 15 years later, the monster rages on in New York City. Join us for two sets of jams and surprises as we kick off Halloween weekend and celebrate a decade and a half of funkin’ it up. Featuring special guest vocalists Joe Trombino from the Great Apes, Craig Schoenbaum from OTiS and Angel Eduardo from Blue Food! 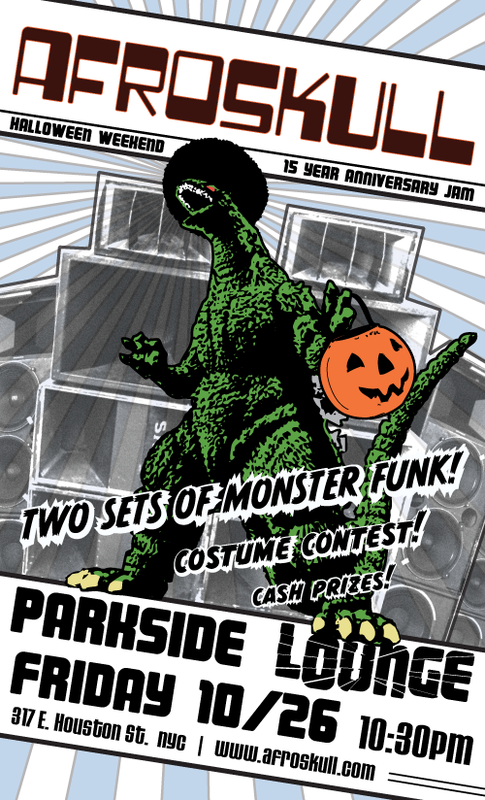 15 Years of Monster Funk!! It has been 15 years since Afroskull, the original monsterfunksters, first took it to the stage in uptown New Orleans. Come celebrate this milestone with us back where it all started, at the world famous Maple Leaf Bar. Founding members Joe Scatassa, Bill Richards and Jason Isaac will be joined by a few of their most fiendishly funky friends to bring you two sets jam packed with a decade and a half’s worth of progressive funk-rock. Were the Mayans right? Could THIS be the end? Find out October 6th at the Maple Leaf! We have picked up another last minute gig here in NYC. Catch us tomorrow night at 8pm at Brooklyn Bowl, opening for Big Sam’s Funky Nation. So psyched to be sharing a bill with our old friend Big Sam! Come on down for the funk, the whole funk, and nothing but the funk! Join us for a super-secret-surprise show this Friday night! We will be making our debut at Brooklyn Bowl, opening for the amazing Soul Rebels brass band from New Orleans. The ‘Skull rocks the Bowl at 8pm. Click here for tickets.